How hard is natural stone exactly? With natural stone it is a bit of a trade off – you always need to weigh up your wants, style and taste against the performance. Then you decide what you are willing to compromise on. If you’re a total perfectionist and want that white benchtop looking crispy new forever – but have your heart set on Calacatta marble – you may need to consider a quartzite instead. If you’re more relaxed and don’t a bit of red-wine loving on your stone benchtop, choosing marble will not be a problem for you. One of the best things about natural stone is that there’s always an option! 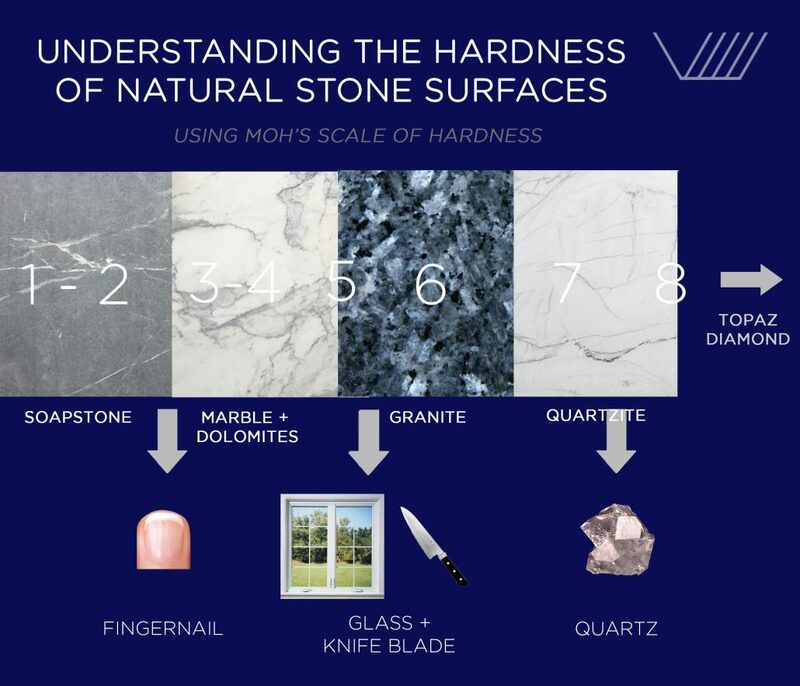 Our infographic positions Soapstone, Marble, Granite and Quartzite on Moh’s Scale of Hardness, compared with relatable and universal items. The scale is designed relatively, comparing different minerals to each other. It starts at 1 and ends at 10, from the softest to the hardest. This means that the higher numbers can scratch the lower numbers. For example, a knife blade can scratch marble, but it cannot scratch quartzite. We hope this infographic will make the selection process easier for you!